P.E.I.’s construction industry is rolling out Phase 2 of a multimedia campaign to address a shortage of workers while levels of construction activity continue to rise. Phase 2 of the Island Builder campaign will consist of promotional videos, a continued radio campaign an a promotion focusing on high school students. P.E.I. 's construction industry is rolling out Phase 2 of a multimedia campaign to try to address a shortage of workers while levels of construction activity continue to rise. Phase 2 of the Island Builder campaign will consist of promotional videos, a continued radio campaign and promotions focusing on high school students. Sam Sanderson, general manager of the Construction Association of P.E.I., said getting in front of youth is key to attracting more workers. "We are in the process of producing some videos to get the information out there, let people know the opportunities that there are within the industry." Those videos will be spread through social media and presented at job fairs and events at high schools, because the message isn't getting out to people the way it should be, Sanderson said. "The plan is to move forward and do some presentations, again to show the youth there are great opportunities and tremendous potential within the construction trade sector." Part of this phase of the campaign is sending out the first ever wage and salary survey to highlight the earning opportunities in the sector, Sanderson said. "We know we saw a huge increase. We've seen a huge increase in salaries and benefits of being in the trade sector the last couple years and we certainly want to showcase that and again strengthen the opportunity potential." Construction work is no longer a seasonal job, it's year-round employment, Sanderson said. Construction demand means smaller projects may take longer on P.E.I. 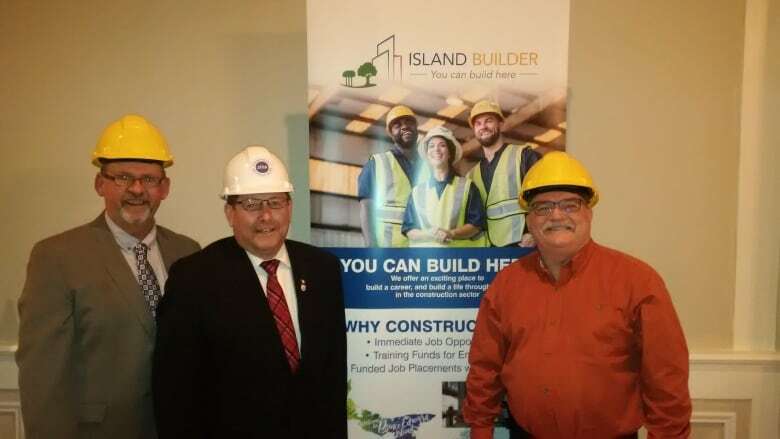 The Island Builder campaign started last year as a way to attract skilled workers and those interested in a construction career and it attracted quite a few people, Sanderson said. "It was also put in place to help the members of the Construction Association of P.E.I. to find skilled people, because moving forward one of the biggest issues facing not only Prince Edward Island, but Canada, is a shortage of skilled trades people." The construction sector employs 5,500 workers in P.E.I. Demand for an additional 1,200 employees over the next four years is expected because of new construction activity and retirements. The provincial government has provided the campaign with $125,000 in funding. The campaign is also supported by the P.E.I.-Canada Labour Market Development Agreement.